Have you seen this new tool from the University of Utah Health Care group? 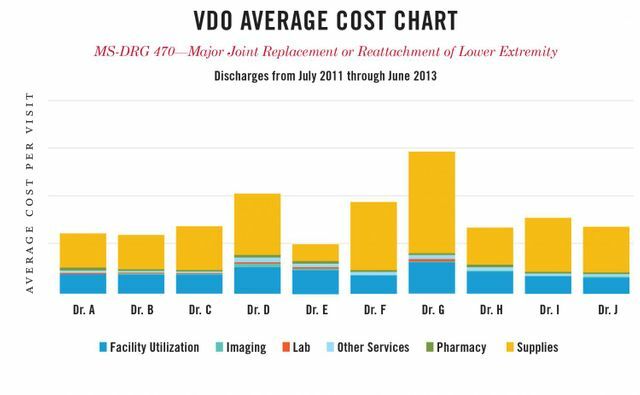 Their Value Driven Outcomes (VDO) program has an interesting way of bringing more transparency to the real costs associated with procedures in healthcare--down to the bandage and nursing time involved! Clearly, use of the VDO requires significant understanding of the activity based costs (ABC) involved in performing a procedure. Could you apply a tool like the VDO graph in your organization? Bucking national trends, a new study shows that a program is making a difference in healthcare quality and cost. Developed by University of Utah Health Care (UUHC), the so-called value driven outcomes (VDO) program breaks down health procedure costs to the level of each bandage and minutes of nursing time, revealing variabilities that are otherwise hidden from view. After addressing inefficiencies exposed in three common procedures - joint replacement, in-hospital laboratory testing, and sepsis management - patients fared better and costs fell by up to 11 percent. The results were published online in the Journal of the American Medical Association (JAMA) on Sept. 13. "The transition of health care from volume to value is no longer theoretical, or wishful thinking," states an accompanying editorial written by health care transformation leaders, Michael E. Porter, Ph.D.